West Bengal Staff Selection Commission (WBSSC) had successfully conducted written exam against the recruitment ADVERTISEMENT NO. 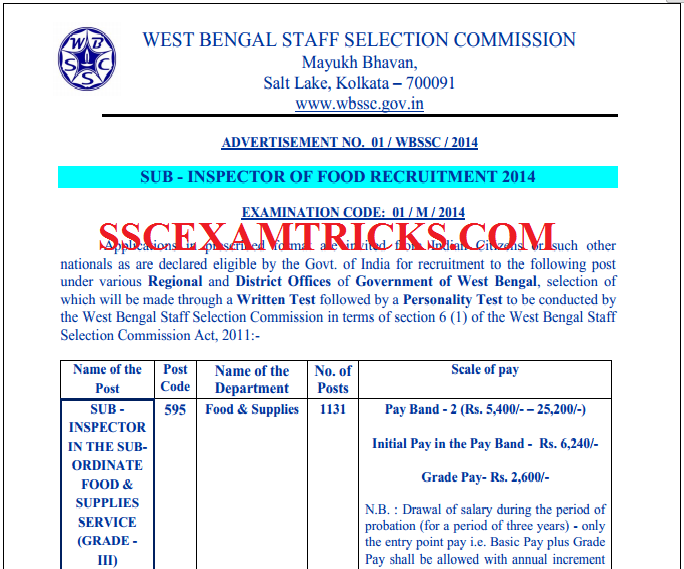 01 / WBSSC / 2014 Post Code 595 for 1131 posts of Sub-Inspector in Subordinate Food and Supplies Service Grade III on 27thJuly 2014 at various centres of all over the country. The latest news is that WBSSC has released the result of written Exam of Food Inspector. Those candidates who had appeared in WBSSC EXAM 2014 and waiting for the result can download the result from the direct link provided in the end of the posts for the convenience of candidates. Click on the print option provided on the screen. WBSSC Exam was conducted on 27th July 2014. The WBSSC Exam was conducted by Pen MODE. There was OMR sheet needed to be filled by Blue/Black ball point pen. The exam consists of various sections Arithmetic (50 questions of 50 marks) and General Studies (100 questions of 50 marks). The exam was a multiple choice question paper of 150 questions of 100 marks and four options were provided out of which candidates need to choose one correct answer. The time duration was of 1 ½ hours or 90 minutes. There was a negative marking of 1/4th marks for each wrong answer deliver in the exam. For more information candidate must download syllabus and exam pattern of WBSSC Exam from the official website. WBSSC has released cutoff marks category wise for Food Inspector Exam 2014 which is mentioned as Unreserved- 15, Backward Classes (Category-A) – 10, Backward Classes (Category-B)-10, Scheduled Castes 6, Scheduled Tribes 6. This was the minimum marks required to qualify for exam. The WBSSC Food Inspector Exam 2014 has been released and short listed candidates will be called for Document verification and Personality Test as per schedule of WBSSC which will be released on the various dates from February 2015 to April 2015. · Click on the link say Document Verification & Personality Test Schedule of Food Inspector 2015. · The Personality Test Schedule will be displayed on the screen. · Click on the link say save as pdf or print the Personality Test Schedule. · Save and print Personality Test Schedule Hard Copy for the Personality Test requirements. Personality Test will be conducted in two stages. All the selected candidates must reach the venue of Personality Test at least 20-30 minutes before the time mentioned on the Personality Test Call Schedule of the candidate. Selected candidates are required to bring computer generated online application, result print, original documents (10th, 12th, UC DMC, Cast certificate –If applicable etc.) and one set of self-attested of all the documents to the venue of Personality Test. 10th Certificate is used for Age Proof. Candidate must bring at least one Address proof i.e. PAN Card, Ration Card, Aadhar Card, Voter card or Driving License. Candidates are advised to bring two extra colored recent passClerkrt size photograph (same as pasted on computer generated application form) required for application form or other document requirements. 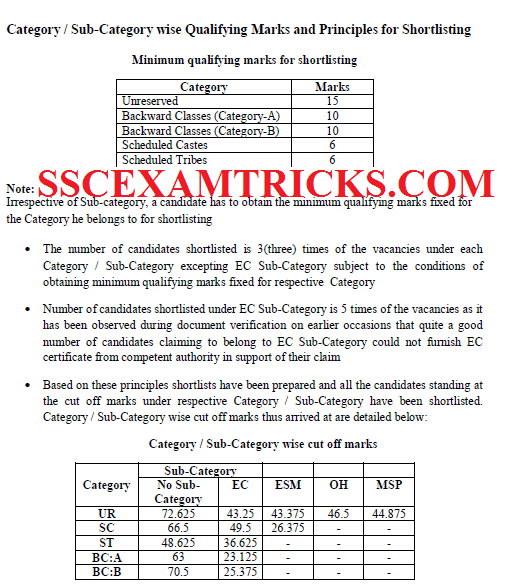 Candidate must bring Caste/PWD/EXS certificate to claim for seat available for reserve category. If the candidate is an employer of any organization then it is mandatory to bring original as well as photocopy of NOC (No Objection Certificate) with them. · Photo Identify Proof such as Adhar Chard, PAN Card, Driving License, Voter Card etc. Withholding of Results: Some candidates (roll no. mentioned in the PDF file provided in the link) investigation process is going on and result will be displayed after completion of verification.